Discover how governments, corporations and the media have been complicit in climate denial. And learn how technological solutions, civil resistance and market leadership offer hope that a genuine turnaround is still possible. 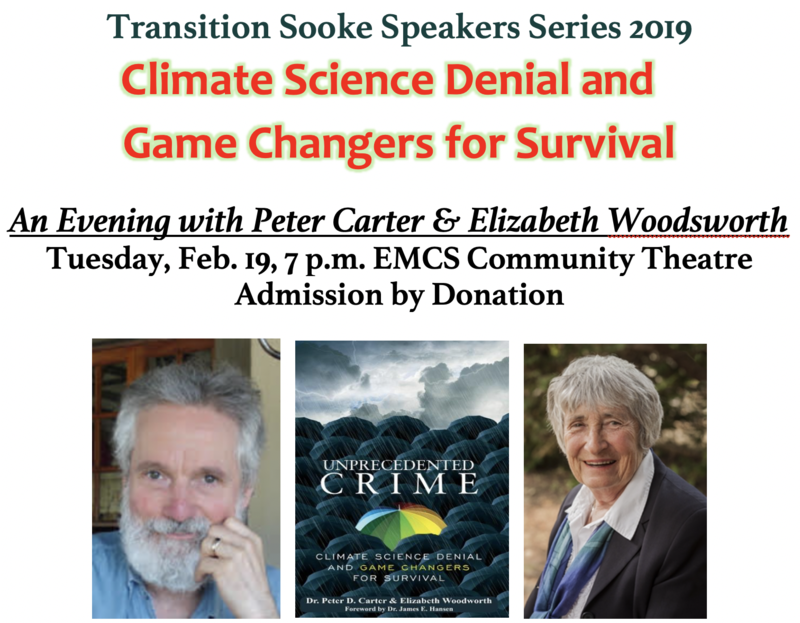 Unprecedented Crime: Climate Change Denial and Game Changers for Survival (Clarity Press, 2018) is a powerful and persuasive climate-change book written by Peter Carter and Elizabeth Woodworth. 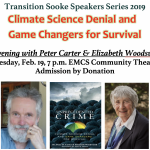 The authors will be in Sooke on Tues. Feb. 19 to address the book’s key themes at the first in this year’s Transition Sooke Speaker Series. Dr. Peter Carter has served as an expert reviewer for the Intergovernmental Panel on Climate Change’s fifth climate change assessment in 2014. He has presented on climate change issues (especially the implications of global climate change on food security for the world’s most vulnerable regions and populations) at science and policy conferences in Canada, the United States, Europe, Asia and South America. He was a family and emergency medicine practitioner before retiring to focus on the climate crisis for the sake of his sons and their children. Elizabeth Woodworth is highly engaged in climate change science and activism. She is the co-author of Unprecedented Climate Mobilization, and co-producer of the COP21 video “A Climate Revolution For All.” She is author of the popular handbook on nuclear weapons activism, “What Can I Do?” and the novel, The November Deep. For 25 years, she served as head medical librarian for the BC Government. For more information, contact Michael Tacon mokijohn@shaw.ca, phone 778-352-0167. 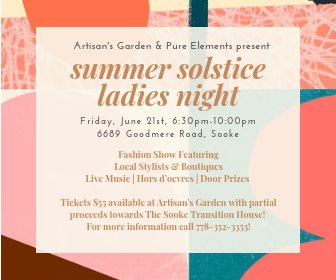 Transition Sooke is a citizen’s initiative working towards a resilient, sustainable community rooted in Sooke’s people, strengths and traditions. Visit our website.